Intuitive, easy-to-use Body Mass Index tool. Calculates adult body mass index with one simple turn of the wheel. Set height at weight and read the BMI number and range. Available in English or Metric. 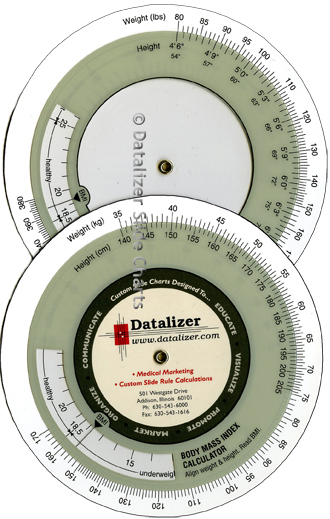 Imprint Size: 2.25" diameter circle. Materials: White plastic base dial and clear plastic top dial. No problem! Just tell us what you need. We'll help you get it done. Available with or without your contact information custom printed on each item.